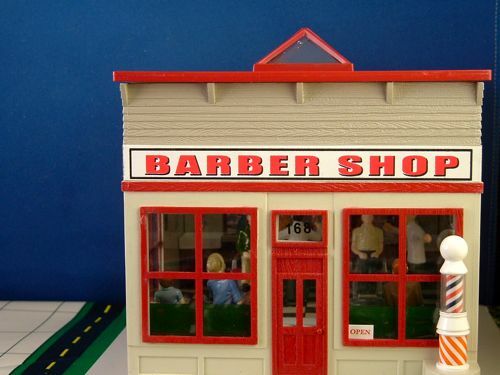 Barber shops have long been a staple of model train layouts. 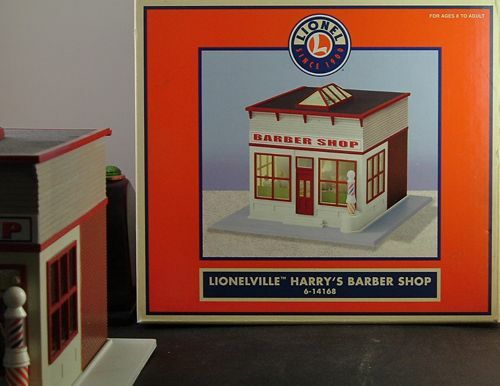 But none of them comes close to Lionel's Harry's Barber Shop, one of the most detailed of the Lionelville series of animated train accessories. Two interior lamps light. 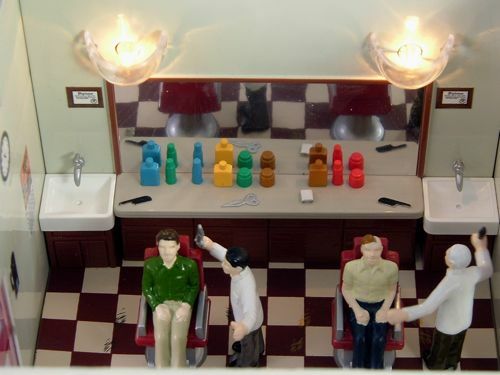 Two animated barbers in the shop barber customers. The exterior barber pole both lights and rotates. 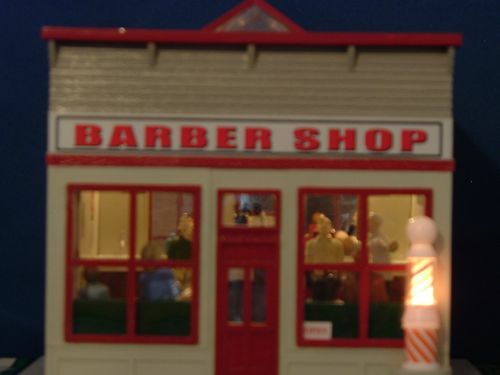 The barbers can be seen through windows on three sides of the shop, as well as through the skylight of the removable roof. The well-made plastic shop is designed for "O' guage train layouts, and measures 5 X 6 inches X 6 inches high. It comes with a removable 7 X 8 inch plastic base. The box dates this shop from 2002, as Lionelville no. 6-14168. It can sometimes be found on E-Bay for between $100- 200. Above left: The shop and 2002 box. center: shop exterior view. right: lit barber pole. 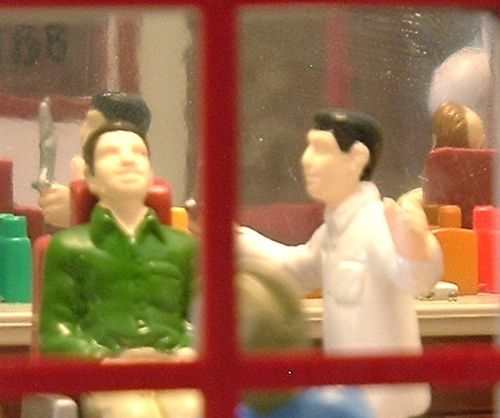 Below left: barber and customers seen through front shop window. center: lit interior view with part of front outside wall, roof removed. right: detail of interior lamps, with both barbers at far extreme of movement. The dark-haired barber holds a scissors, and the white-haired barber holds a brush. He must have held a clipper previously, because the customer has half his head shaved. Below left: lit barber pole outside the shop. right: barber and customer seen through front window. Above left: interior side wall. 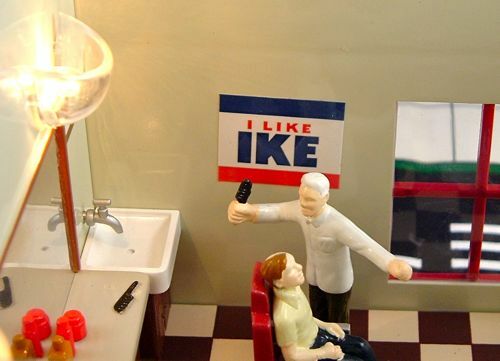 "I Like Ike" poster locates shop securely in the '50s. 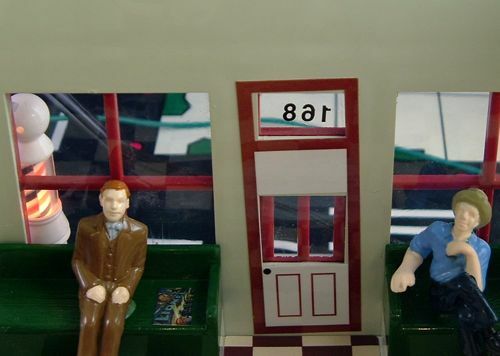 center: two customers in waiting area, with lit barber pole seen through window, and a tiny replica of a Lionel Catalog on the bench. 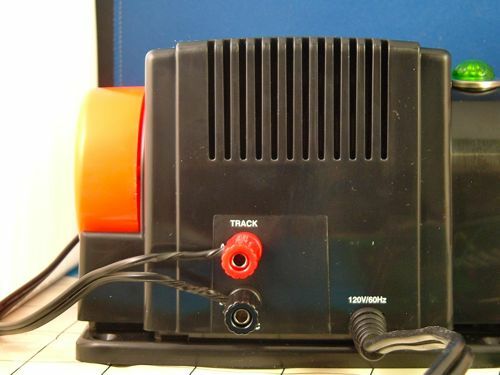 right: Lionel PowerMax transformer has an output of 18 volts AC, 30 watts. The barber shop runs at 12- 18 VAC. Below left: Rear terminals of the transformer, marked "track". The red and black binding posts are marked "A" and "U", respectively. center: bottom view of the shop. 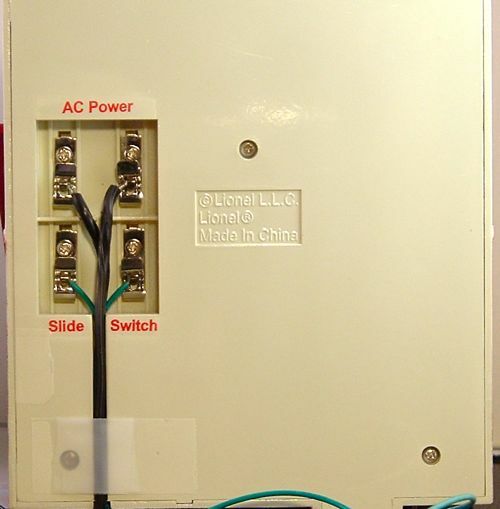 The transformer is connected to the two top terminals, labelled "AC Power". right: the included slide switch is connected to the bottom terminals, labelled "Slide Switch". 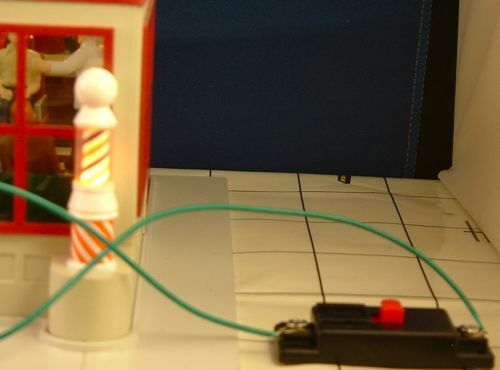 With this set-up, the two interior lamps and the barber pole will light when the transformer is turned on, with the orange lever on the right of the transformer pushed forward to maximum. 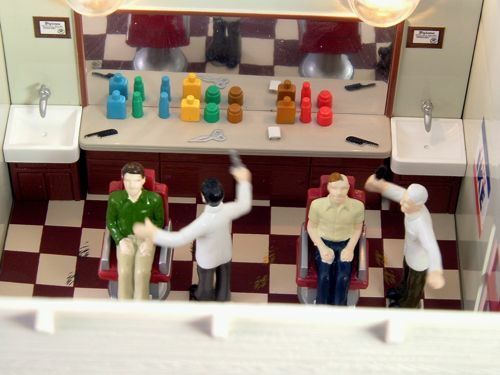 The slide switch turns on the animation for the barbers and barber pole. 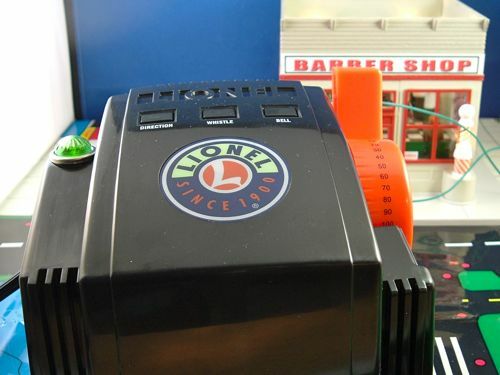 The eight page manual included with the Barber Shop also explains how to wire the shop for various Lionel train layouts using TrainMaster Command Control or accessory switch wiring, and how to replace the interior and barber pole light bulbs.